Hammer Curls for biceps is one of the best exercises you can do to build biceps. It recruits and strengthens supporting muscles surrounding the biceps. That way the Hammer Curls workout is to some extent different from the Bicep Curl as it engages added muscles to target the biceps from all angles. Including Hammer Curls together with Bicep Curls into your strength-training program makes for an effective balanced workout plan for your arms. Read on here to learn how to perform dumbbell hammer curls perfectly with tips and a VIDEO towards the end of this article demonstrating the correct start position and proper movements. Stand up upright, holding a dumbbell in each hand at arms length along the sides of your body. The palms of your hands should be facing your body and the elbows tugged close to your body. Straighten your spine and draw in your abdominal muscles.This is your start position. 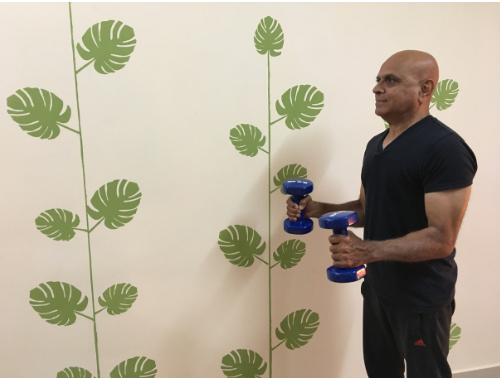 While keeping the upper arms stationery throughout the movement and contracting your biceps, bend your arms at the elbows and curl the dumbbells all the way towards shoulder – keeping your palms facing each other. Continue to raise the dumbbells until they reach shoulders height and the biceps are fully contracted. Pause at the top for about a second as you squeeze your biceps as hard as possible. Then slowly lower the dumbbells back to the start position in controlled movement. This completes one repetition. Note: You can curl both dumbbells at the same time or alternate them. (i) Don’t lean back. Avoid swinging your arms. Use your muscles to lift the dumbbells. (ii) Keep your elbows tugged close to your sides and your upper arms stationery throughout the movement. Move only your fore arms. (iii) Slow and controlled movements build muscle faster as it ensures that your muscles do all the work and you don’t cheat using momentum. If your reps are going out of form, reduce dumbbells weight. (iv) Pause for a second and squeeze your biceps at the top of each curl to get better results. (v) Straighten your arm completely at the bottom of each rep before you begin another curl to ensure that your bicep muscles move through a full range of motion and work harder to achieve greater results. Variations: You can do this exercise while sitting on a bench with or without back support and can also do it by alternating arms; first with the left arm for one repetition, then the right, then the left; and so on.